When customers see our Sewnatra compact cabinet one word always pops out of their mouth “CUTE”. Besides being a cute cabinet this cabinet offers most of the features our larger cabinets have, but in a compact size. The cabinet’s air-lift mechanism raises and lowers your sewing machine into place with a simple push. The mechanism is adjustable for all types of sewing machine base heights. The cabinet also comes with a unique universal insert to create a flush sewing surface when the mechanism is in the flatbed position. 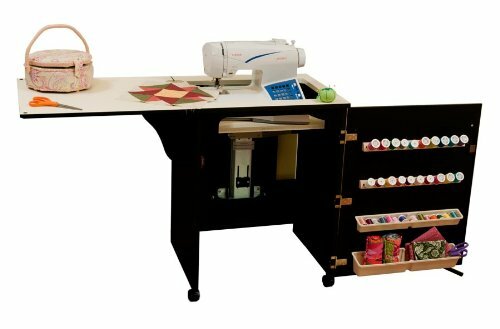 The cabinet can be used for your sewing machine or serger. The cute shuttered door has 2 thread spindles and 2 trays for your sewing accessories. When closed the shuttered door gives the cabinet a cottage look and could be used as a night stand or other fine piece of furniture in a room. Sewnatra comes in crisp white, classic oak-grain or black to complement any decor.